Yesterday evening the husband and I went to a Lyle Lovett concert at Ste. Michelle Winery in Woodinville. For those unfamiliar with Ste. Michelle, it’s probably one of the biggest wineries in WA state. 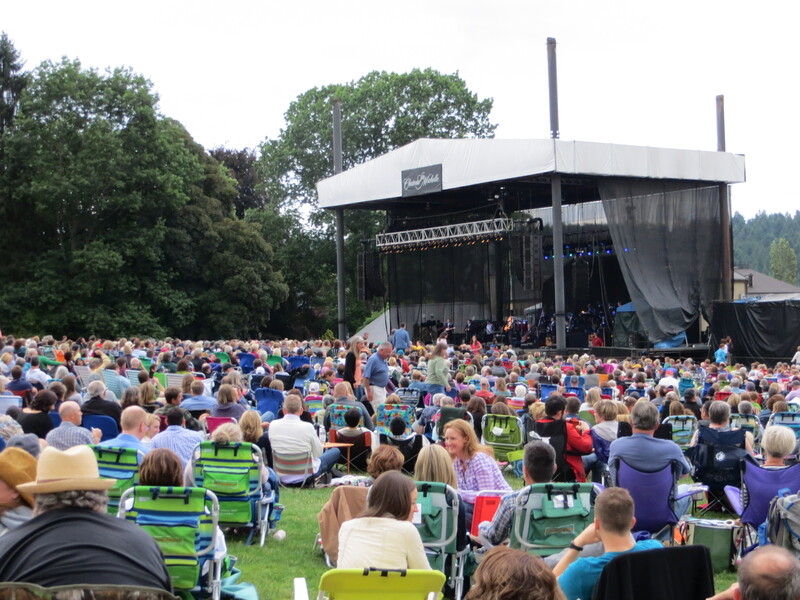 We attend a concert at their venue annually and have seen Amos Lee, Diana Krall, Harry Connick Jr, amongst others. A lot of times I’m not particularly familiar with the artist we see, but to me it doesn’t really matter, because it’s mostly about the experience. 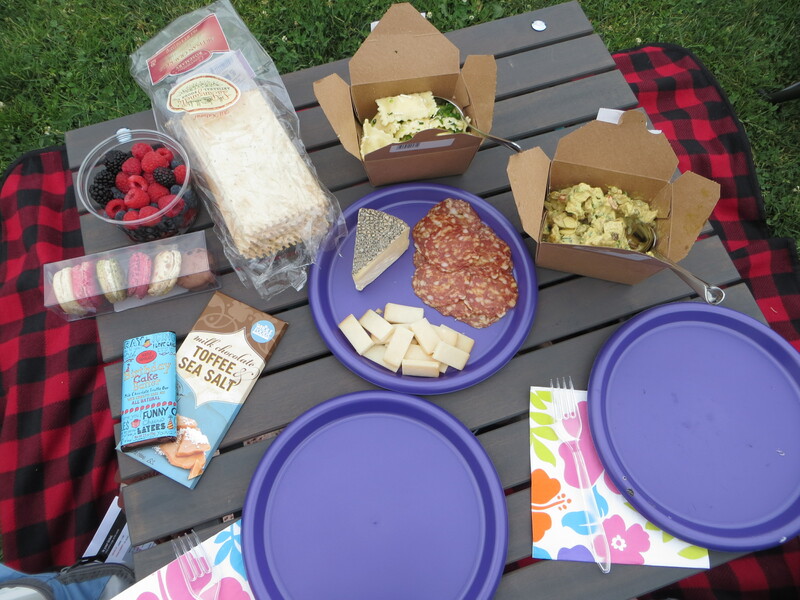 We got into Redmond about 1 pm and immediately hit Whole Foods for picnic goods. Now, I would never shop at Whole Foods on a regular basis, even if there was one where we live. Cool store…outrageous prices. 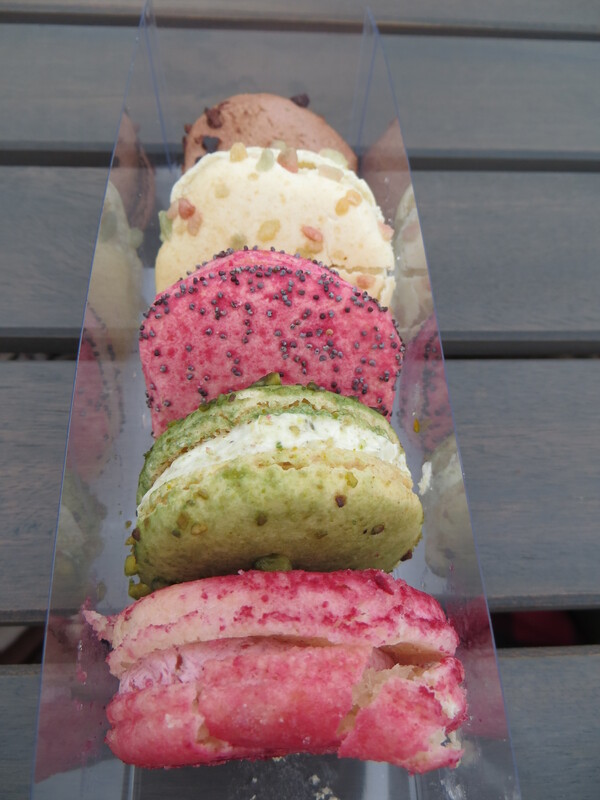 Though they do carry a fresh gnocchi that I’ve grown fond of…. But, part of the Ste. Michele experience involves a great picnic. 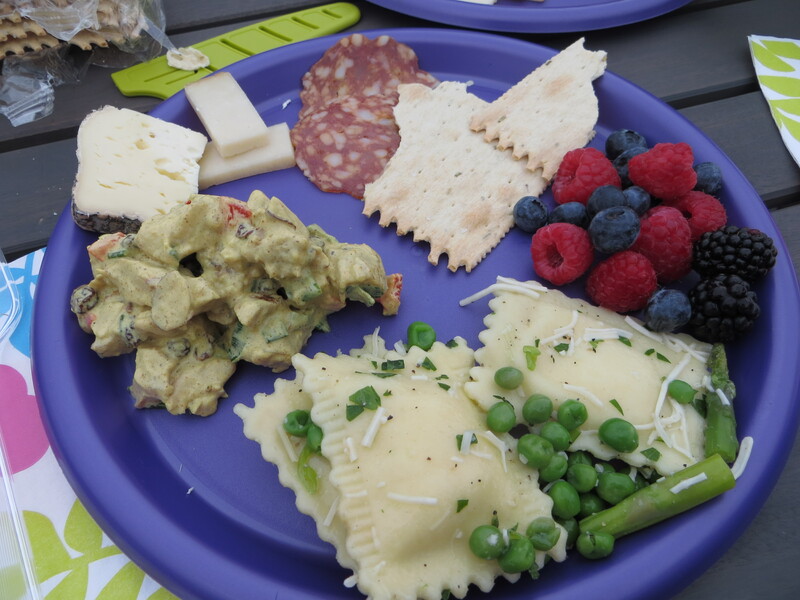 I will not share the price tag attached to the salami, cheese, crackers, lemon pea asparagus ravioli salad, curry chicken salad, macarons, Seattle chocolate birthday cake chocolate bar and fresh berries. Let’s just say that when we walked away from checking out the husband and I looked at each other and said, “Holy crap!” It didn’t help that there were two boxes of the aforementioned gnocchi in the bag. We stopped by our hotel for a bit to relax and change. Remember that we’ve been having unnaturally dry, warm weather. We were excited that the weather cooled yesterday, but were a bit concerned by the grey skies that were occasionally spitting showers. It was jeans and tennis shoes for me and we took our raincoats (which we ended up not needing). Actually, the evening turned out quite comfortable. Just needed a fleece. We headed to the venue at 3:30. The gates open at 5. See, there is strategy attached to concerts at Ste. Michele; we buy general admission tickets, which means we pull up a piece of grass. Therefore, it’s important to be amongst the first in so we can stake claim to a good spot. We were in line by 4 and, along with everyone else, unfolded our stadium chairs and took a seat. I played Yahtzee and Wheel of Fortune on my phone, the husband caught up on blog reading (mine). We got in around 5:15 and I dashed ahead to get us a spot. Yes. Really. We laid down our blanket, set up our chairs and arranged our soft-sided cooler. The husband offered to set up the table-in-a-bag and did that while I went to the wine tent and bought a couple of bottles before the line got too long. The table is a recent acquisition as we had tired of balancing food on the blanket. It works like a dream and I heard people to our right expressing table envy. That used to be me. 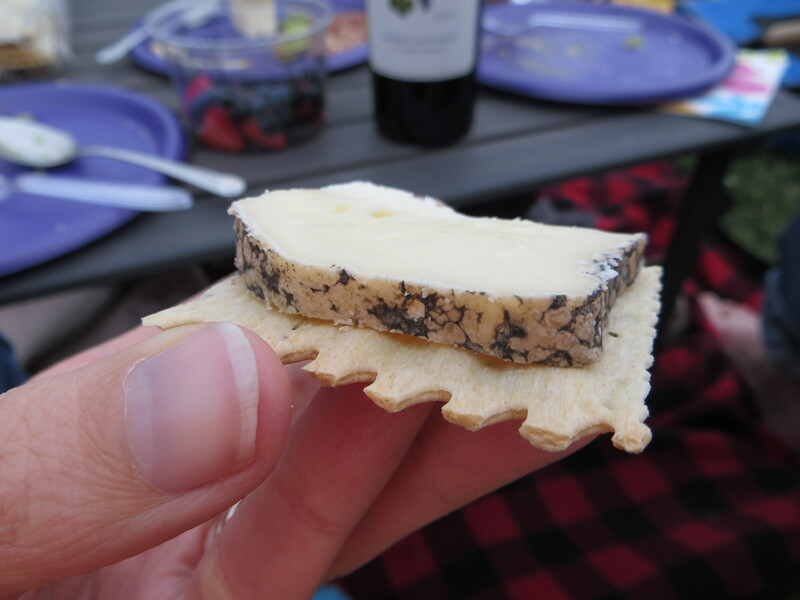 I came back with wine, popped the cork on a tasty little Cabernet Sauvignon (good thing it cooled down, my enthusiasm for red waned a bit when it was 85+ degrees), spread out our picnic and indulged. 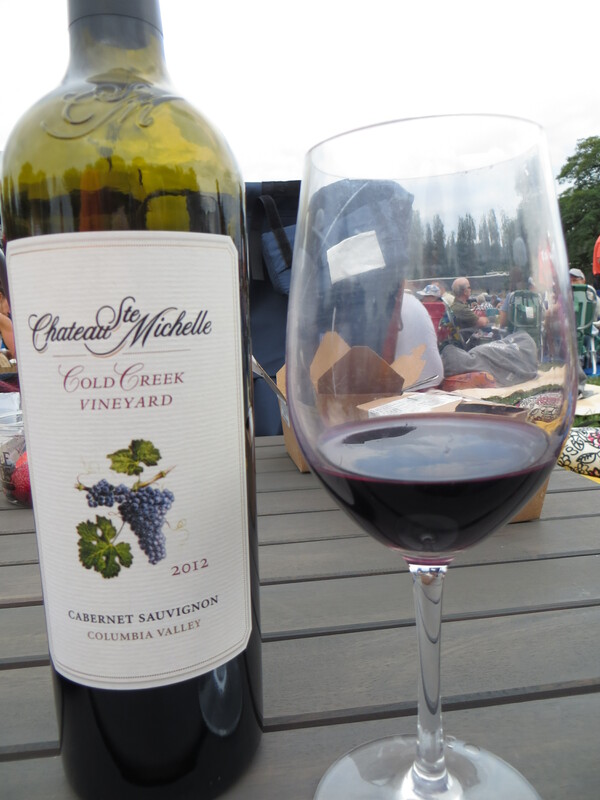 After a leisurely picnic we cleaned up, put the table away and sat back with our wine awaiting the start of the concert. I know who Lyle Lovett is (he’s the goofy looking guy who married Julia Roberts back in the 90’s), but am unfamiliar with his music. He had his large band with him and played a mix that’s difficult to describe. Some songs had a bluesy feel, others gospel, others country. Francine Reed (who I also had not heard of), a blues singer, is part of his large band and was singing last night. She is impressive. Lyle was funny and humble and just made for a really enjoyable evening. One of the things I love about this venue is the atmosphere: it is laid back. I’m not much of a concert-goer because of the crowds. People all in my space, everyone standing, people all in my space. Ste. Michelle concert-goers, lubricated with good wine and warm summer evenings, are my kind of people. No one stands until the encore. People are enthusiastic, but polite. We’re kicked back in our chairs, sipping good wine….chillin’. We were much closer than this. I just wanted to give you an idea of the venue. Lyle and band started a little after 7 and wrapped up a little after 9. We scurried back to our car and managed to be one of the first out of the venue. Don’t know how we did that…usually it takes 30-45 minutes to get out of the parking lot. It was another great concert at Ste. Michelle. So, now I’ve shared all of my secrets for attending a concert Ste. Michelle. Don’t use them against me and crowd me out next year. 🙂 Actually, I think you could glean information from this post that could be used at any outdoor venue. All it takes is a little planning: good food, an extra sweatshirt, a cool table and plenty of wine…what more does a picnic need? Until next year, Ste. Michelle! We saw a great show there last summer! 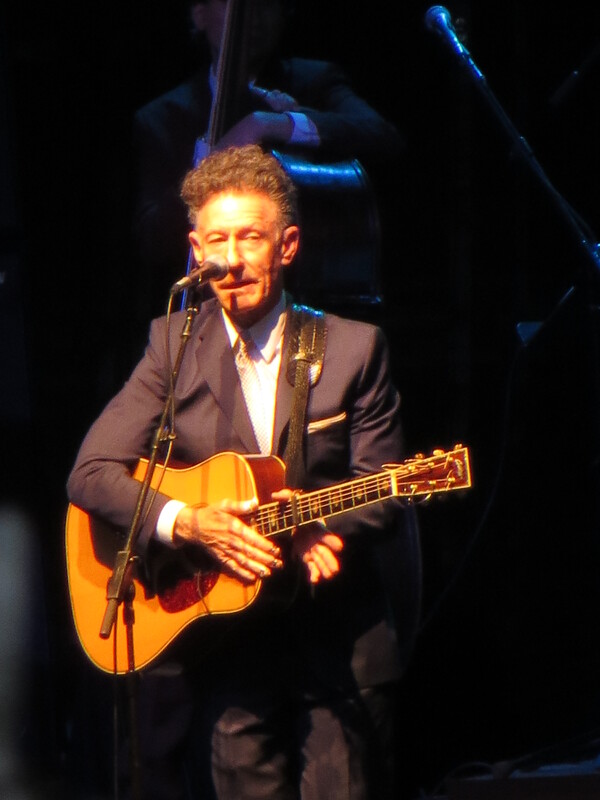 Lyle Lovett is looking quite a bit older than the stock mental image (probably from People magazine in the grocery store) that has been stored in my brain the past umpteenth years. I’m replacing it with your picture…….